Earlier this year, I was able to print up copies of different newspaper articles from the ProQuest Website from their Historical Newspapers Collection. 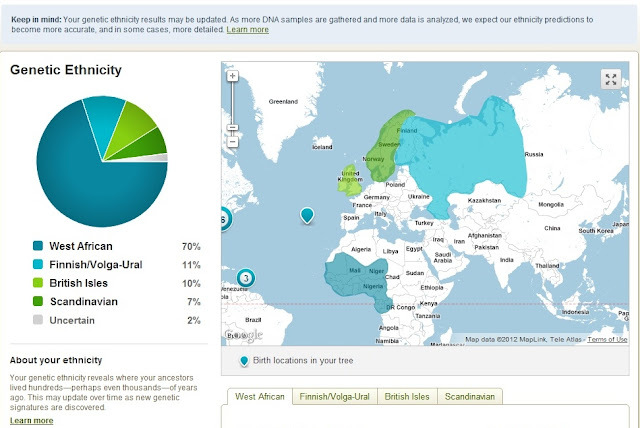 Some of these articles only had a line or two about a particlular family member, but I have found them so interesting to review because they seem to "flesh out" my ancestors a little more. These folks are not just names and dates of birth and death. They were real people and I truly have enjoyed learning more about their lives. 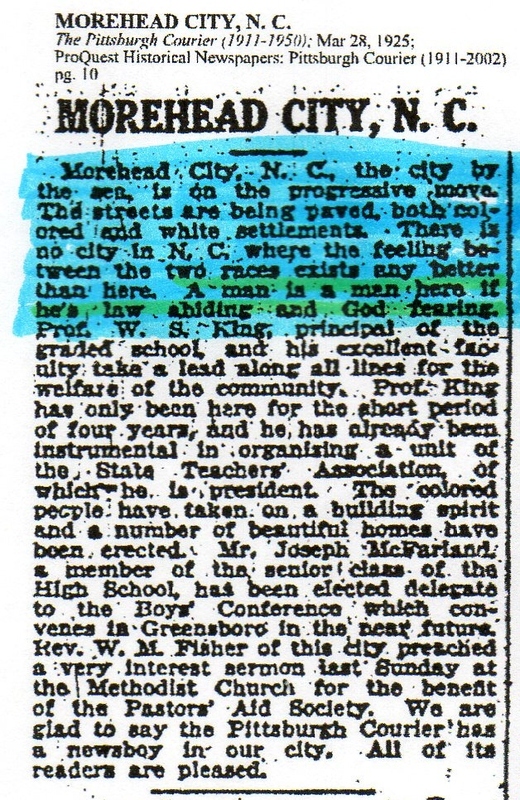 I have to say I am most impressed with the Morehead City neighborhood that sustained many of my ancestors. There was a true sense of community and it appears that people really valued the importance of education. My great grandmother Ophelia was a school teacher, as well as her oldest daughter Loris. 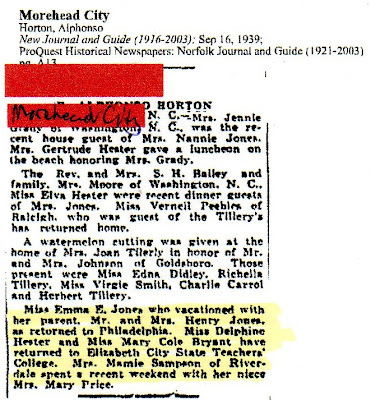 My grandmother Mary Bryant Horton, attended Elizabeth City State Teacher's College along with my newly found cousin Amy's mother, Delphine Hester Johnson. 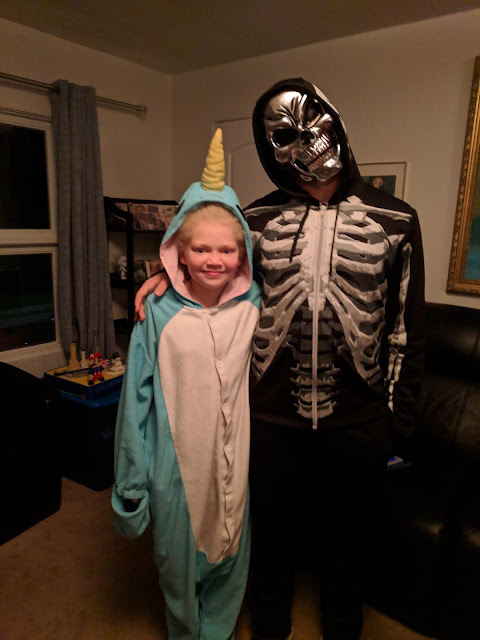 Here's an article I have, which mentions them both. 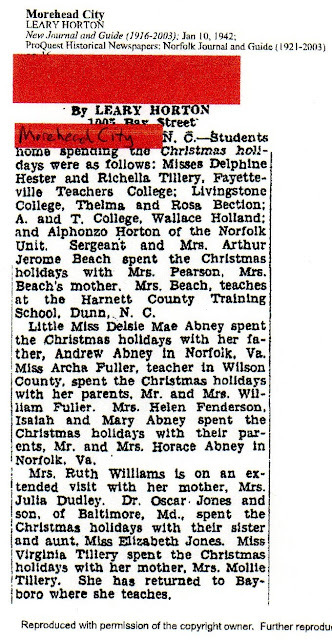 The next article mentions Miss Delphine Hester being home for the Christmas holidays, as well as many other Morehead City youths. She was a dedicated elementary and special education school teacher at Queen Street High School and Beaufort, North Carolina Elementary School for over 30 years until her retirement in 1977. she loved teaching so much that she recently started Delphine's Workshop, to teach other residents at White House Healthcare and Rehabilitation Center in Orange, N.J. where she resided since 2000. 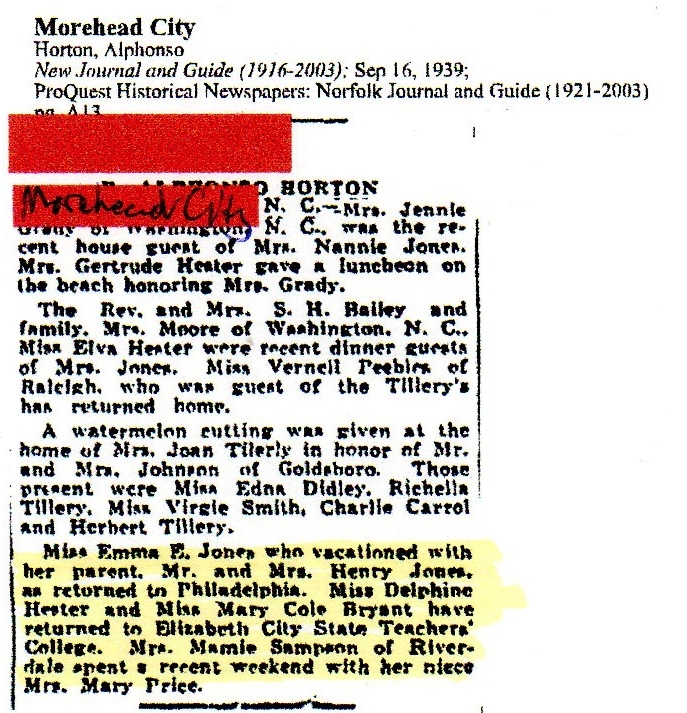 My grandmother Mary Horton, had to drop out of school in her youth. However, it is something that was always on her mind and proudly I can say she did eventually earn her Bachelor of Arts degree from Queens College, in NYC in her later years. I believe that it was in 1980 that she graduated. My aunt Rosa Sanders attended college specifically, Virginia State University, until her funds ran out. Maybe I am reading more deeply into this than what the information presents...but I don't think so. 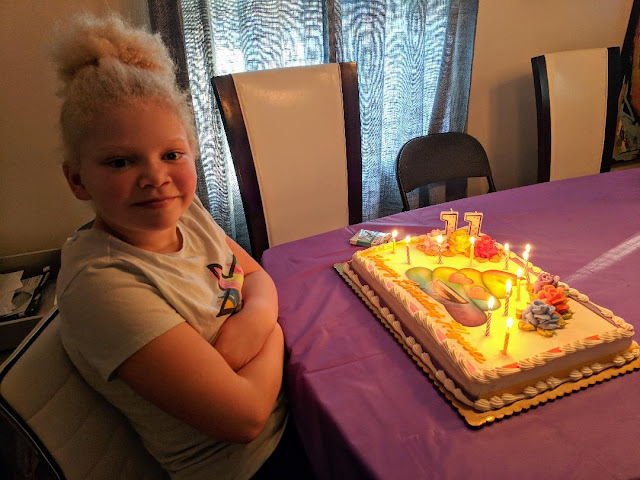 I think there was a nurturing going on in this community, that allowed the next generation to go out and do better than those that came before. That's just my opinion, but here's another article that I have that may illuminate why this was possible. Pay specific attention to the highlighted part.